The Appliance E.M.T. of Kaysville, Utah, provides fast in-home appliance repair service in a professional, friendly, and timely manner to all of Davis County, Utah. I was called out on a dryer that quit heating. It slowly got worse and worse, taking longer to dry clothes. I took it apart and had to start laughing when I found the problem. The dryer vented out to the back yard by a planter that was filled with red lava rocks. The five year old son thought it was fun to drop rocks into the vent from the back yard. He had completely filled the aluminum four inch vent with rocks. When I disconnected the vent, they came pouring out like a lava rock landslide. It took a while to clean up the rocks, but it was really funny. I think that is something I would have done at age five. We are the Professionals in Kaysville Utah for all of your appliance repair and service needs. I went on a refrigerator job not too long ago, where the refrigerator wasn't working properly. It had been working poorly for a couple of years, but the gentleman lived alone and put off calling us. He said that he usually ate out anyway. This unit hadn't defrosted in quite a while. He was concerned because the ice was so large he almost couldn't fit his milk in there any more. 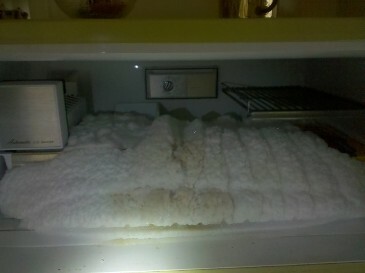 Give us a call if your refrigerator isn't defrosting, before you have an ice blob that is taking over your kitchen. Make sure to call us today in Kaysville at 801-773-1911. At the Appliance E.M.T., Help Is On The Way!